According to statistics, more than 2500 people die every year and around 10,000 people are injured due to fire catastrophes at home, office and other places. Fire safety is very important in a flat, at home and at a work place. 1. Switch off the cylinders every time you don't cook. 2. Switch off all electrical appliances after use and whenever you go out. 5. A fire evacuation plan can save lives. All homes should have a clear evacuation plan that is known to each family member. 6. Do not Re-enter a burning house for personal items. 7. Put a fire blanket and working fire extinguisher within easy reach in the kitchen and learn how to use them. 8. Keep match boxes, lighters and other danger items away from children. 9. Get your chimney cleaned regularly. 10. Do not smoke in the bed room and make sure you clear the ash tray before going to bed. 1. Know where the smoke alarm is located and know how to use it. 2. Know the smoke detection system in the office. 3. 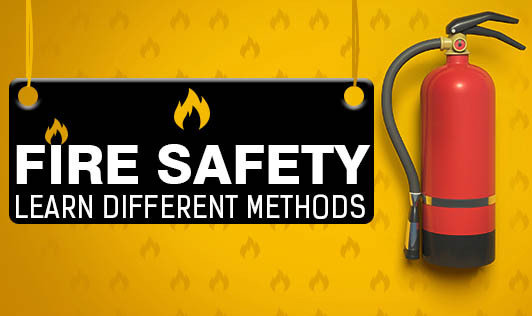 Keep fire safety measures and have a training session for employees periodically. 4. Do not smoke near the smoke detector as it can be misleading. 5. Do not throw a half used cigarette near any carpet or coir. 6. Store hazardous materials in designated areas. 7. Keep equipment clean and use it properly. Keep these things in mind and make sure you follow them when the need arises!